If you are looking for information on the Coffee Culture franchise business opportunity, Coffee Culture franchises or Coffee Culture franchising, then you have come to the right place. 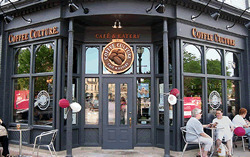 Anyone who has traveled will recognize that Coffee Culture is designed as an Old World style coffee house where customers make it a frequent destination for conversation and relaxation. Coffee consumption in The United States is over $18 billion a year. Coffee Culture aims to be your neighborhood meeting place. Your senses will tell you best - delicious taste, warm relaxing atmosphere and comfortable seating. We are a place for all ages and occupations from retired seniors to active shoppers and business people. 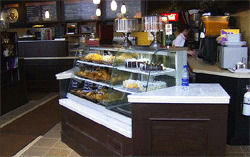 At Coffee Culture we are experienced in the hospitality marketplace. Together we have vast experience in operations, marketing and franchising. The result of our efforts you will see in any Coffee Culture Eatery. You are more than welcome to own more than one Coffee Culture location, depending on your finances, your initial location's performance, and your geography. During the construction process, you will undergo one week of classroom training at our corporate training facility and two weeks hands-on training at an established Coffee Culture location. As you open your store, we'll be with you for two more weeks. This training will cover all aspects of running your cafe & eatery including: Food preparation; ordering inventory; review of operations manuals, hiring assistance, marketing and accounting. You will want to have personable help to cover busy hours and multiple days. However, as we do not have a full service kitchen, training is simple. Your training will occur prior to your opening in an established store location we select. You will be trained in operation, management and community marketing areas.